Despite respectively revolving around heists, high school, family dynamics, oceanography, tourism, and a Roald Dahl book, Wes Anderson’s films have earned a reputation for all being alike. That is to say, they all possess a bright, anachronistic set design and sad adults played by actors surnamed Murray, Schwartzman, or Wilson. 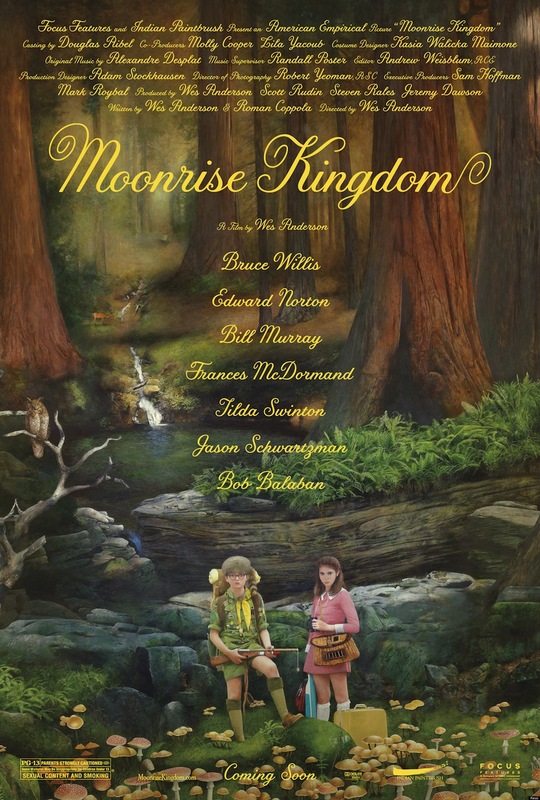 Moonrise Kingdom branches out in one obvious respect by making extensive use of child actors, and in other respects as well. 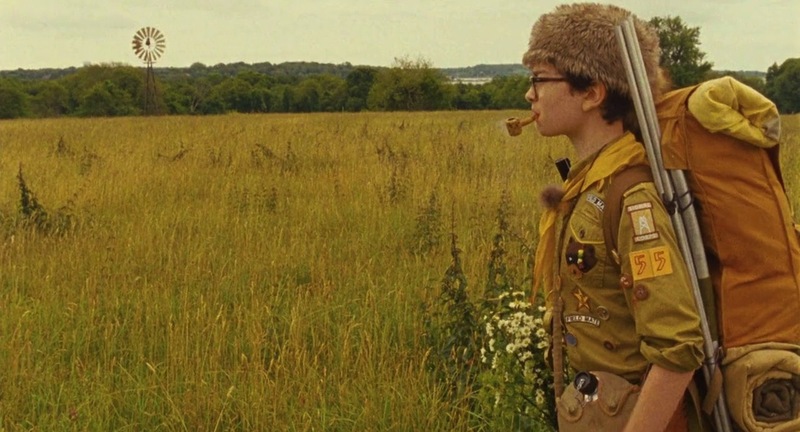 Overall it lacks the coherence of his earlier films, but Moonrise Kingdom very nearly makes up for this with the promise it shows for Anderson to expand his style. Of course, Moonrise Kingdom does fit into several stereotypes of a Wes Anderson film. Bill Murray and Jason Schwartzman appear, surrounded by a knockout cast of Anderson newcomers. (Seriously: who else writes a couple of bit parts and gives them to Harvey Keitel and Tilda freakin’ Swinton?) The usual set design is in full swing; although the movie takes place in 1965 instead of the present day like his other works, Anderson’s fondness for vintage consumer goods makes this distinction undetectable. There’s his usual wry sense of humor and deadpan lines. And yes, the adults are very sad. Mr. and Mrs. Bishop (Bill Murray and Frances McDormand) are sad, Captain Sharp (Bruce Willis) is sad, and Scoutmaster Ward (Ed Norton) is a paragon of earnestness who is also sad. But their sadness is all somewhat tangential to the main story of Sam Shakusky and Suzy Bishop. 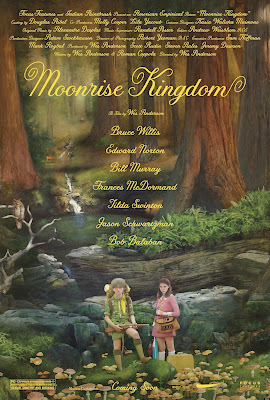 Moonrise Kingdom gives its child actors much more screen time that most movies that are made for an adult audience. Kara Hayward, as Suzy, is the standout, with her perpetual, wounded glower. Jared Gilman delivers several of Sam’s lines flatly, but this doesn’t detract too much from the film. In general, Anderson does a good job of writing kids’ dialogue that isn’t strained or overly adult-sounding. (At least, until he wants to with the Khaki Scouts, but we’ll get to that in time.) Roughly speaking, the first half of the movie depicts the revels of childhood and the second half brings in all the complications of the adult world. The childhood part begins with “A Young Person’s Guide to the Orchestra” and a whimsical tour of the Bishop house and the island of New Penzance. (This too is typical Andersoniana, recalling the Tenenbaum house, Steve Zissou’s ship, the Darjeeling Limited train, and the Fox family’s den.) From here we spend most of the first half following Sam and Suzy’s camping trip across New Penzance, which exemplifies a child’s ignorance of consequences. The pair plan for months to run away and camp on a beach without any consideration of what will happen next. It’s as if they think that running to the far side of the island will solve all their problems, which is probably thought by many a child who impulsively and briefly runs away from home. Not that all is idyllic. Sam’s fellow Khaki Scouts encounter our protagonists in a scene that is equal parts Lord of the Flies and Jean-Luc Godard, which also introduces the film’s more postmodern aspects. Well, not “introduces,” because that honor falls to the narrator, played by Bob Balaban. In The Royal Tenenbaums, we are guided through the characters’ backstories and plotlines by Alec Baldwin’s rich baritone. Balaban’s narrator is a far less conventional fellow. He addresses us directly, looking into the camera at various locales, explaining the setting but giving no details about the characters. Then, to make his role a little odder, the narrator enters a scene and addresses the adult characters. More than that, he drives the plot by telling them where he thinks Sam and Suzy are, revealing in the process that he taught Sam some of his camping skills. This sets up the second half, in which we explore the adults’ various miseries and Anderson starts throwing in genres left and right. About those Khaki Scouts. They hold meetings in a whimsically absurd treehouse, and their dialogue channels tough-as-nails soldiers from old war movies. Why? Why not? To keep the film’s energy from flagging, Anderson inserts Swinton’s Nurse Ratched-homage Social Services, Keitel’s venerable old scoutmaster, and Schwartzman as a sort of summer camp Milo Minderbinder. We get a flood, a fire, lightning strikes, an overpowering Britten soundtrack, and a climax that is equally reminiscent of screwball comedies and Looney Tunes. Like the old screwball comedies, Moonrise Kingdom solves Sam and Suzy’s dilemma with a minute or two of quick dialogue that finally makes use of the fact that the Bishops are lawyers and that Captain Sharp is lonely. He adopts Sam and saves the kids from the sort of calamity that would usually befall Daffy Duck. The screwball ending is a bit at odds with the more serious elements of the story, and for that reason it fails to satisfy. Or rather, Sharp adopting Sam is fine, but the snappiness with which all the adults’ problems are solved mars the ending. Having saved Keitel earlier (from what one can only assume is an intentionally bad special-effects fire), Norton’s scoutmaster is seen happily overseeing his troop in October, when one might normally expect him to be at his day job as a math teacher. Mr. Bishop, after a brief scene in which he doubts that his responsibility to his children can stave off his depression, joins his wife in calling the kids to dinner, apparently signaling his recommitment to the family. This is where a Tenenbaums-style narrator could fill in the gaps for us and give a better sense of conclusion than these snippets do. We don’t mind if a screwball comedy ties together all the loose ends in a slapdash finale; but here it seems like short shrift to the existential crises plaguing the adult characters. And then there’s the matter of the first lightning strike. Part of Captain Sharp’s impetus for adopting Sam is the threat from Social Services that he may be subjected to electroshock therapy. The film’s climax involves Sam being hit by lightning and then transferring a spark to Suzy via a kiss. The seeming implication is that they have both received a natural form of electroshock therapy and will be more well-adjusted as a result. If this is the case, it proves Social Services’ point and legitimizes her off-putting ideas concerning troubled children. And furthermore, it’s unnecessary, since the sweet, understated final scene really does conquer cynicism with its suggestion that Sam and Suzy are just right for one another. Wes Anderson’s previous movies possess their oddities, but remain more coherent and self-contained. This insularity gives them a good measure of their charm, but it also raised the worry that Anderson was bound to become monotonous. 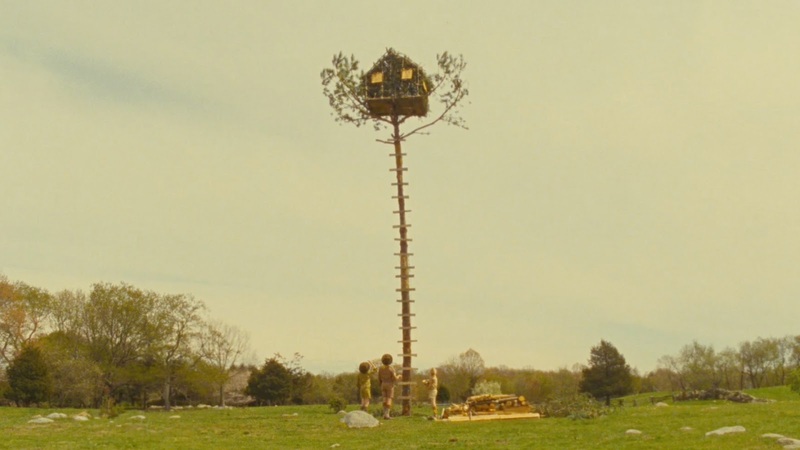 Sure, there were experiments with framing devices (Rushmore and Tenenbaums) and visuals (The Life Aquatic and Fantastic Mr. Fox), but Moonrise Kingdom shows Anderson pushing his boundaries in entirely new ways. It does not marry cinematic inventiveness to story as effectively as, say, Annie Hall or Jules et Jim. 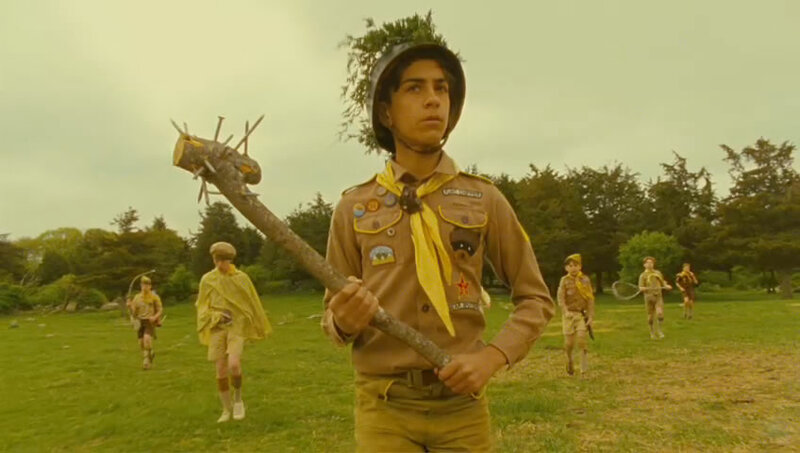 Yet the very elements that make Moonrise Kingdom fall short of Wes Anderson’s best work give his fans reason to be excited for whatever he does next.